Scottsdale and Arizona 2014 sales saw a good start to the classic car auction year with 38 automobiles achieving results of more than a million dollars each including the most expensive Corvette ever. The year started well for classic car auctions with 38 cars achieving more than a million dollars each at the annual sales by Barret Jackson, Gooding & Company, RM Auctions and Bonhams in Scottsdale and Phoenix, Arizona. 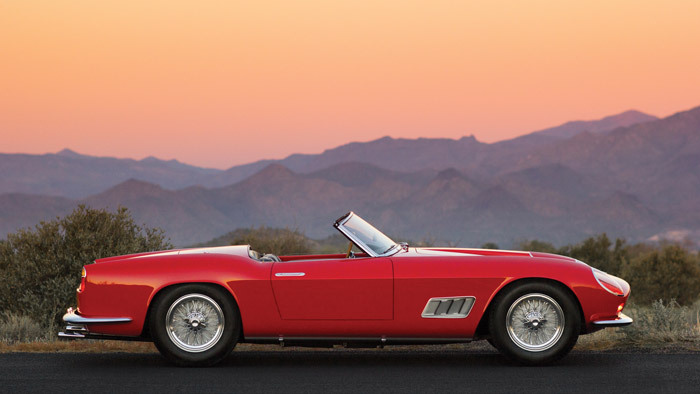 The highest price achieved was $8,800,000 for a 1958 Ferrari 250 GT LWB California Spider. A 1967 Chevrolet Corvette L88 sold for $3.85 million – the highest price ever paid for a Corvette at public auction. 15 of the top 30 best results were for Ferraris while 9 Mercedes 300 SL sports cars also achieved over a million dollars. The mid-January classic car auctions in Arizona (Scottsdale and Phoenix) traditionally mark the start of the auction year for classic, vintage, and exotic cars. All four big classic car auction houses were present in Arizona in 2014. RM Auction’s Arizona 2014 sale on January 16-17, 2014 saw a great start to the year with the highest price achieved over the classic car festival weekend when a 1958 Ferrari 250 GT LWB sold for $8,800,000, the 8thhighest price paid at public auction for a car in the past year. RM Auctions offered 126 automobiles and over a two-day period sold 108 (85% sale-through rate) for a total of $45.6 million – 11 cars made more than a million dollars. Gooding & Company’s Scottsdale 2014 sale on January 17-18, 2014 also went very well by earning a total of $49.4 million and a remarkable sale-through rate of 94% of the 158 lots on offer. 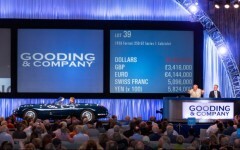 Gooding & Company achieved over a million dollars on 13 cars. Bonhams Scottsdale 2014 auction on January 16, 2014 saw the British auctioneer grossing $25 million with a sell-through rate of 89% on 101 lots. Bonhams, at only its third year at the Arizona week, achieved a million dollars on six cars. The largest auctioneer at Scottsdale, Barrett Jackson, sold 1399 cars over six days including the most expensive Corvette ever. In total, Barrett Jackson grossed $113 m in sales. All prices as provided by the relevant auction house and including premium. It was no surprise that Ferraris led the price tables at the annual Scottsdale and Arizona classic and exotic car auctions in 2014. Half of the top 30 million-dollar cars were Ferraris, including the top two prices: both 1958 Ferrari 250 GTs – one each for RM Auctions and Gooding. Bonhams’ top price was also for a 1950s Ferrari – a 1951 Ferrari 212 Export Berlinetta. The third most expensive car was a 1997 McLaren F1 GTR Longtail sold by Gooding & Co for $5.3 million. This was the first McLaren GTR Longtail to have won a race and was in Fina livery as part of the official BMW racing team. The fourth highest price paid at Scottsdale 2014 was for a 1967 Chevrolet Corvette L88 Coupe, which achieved $3,850,000 – the highest price ever paid for a Corvette at public auction. Barrett-Jackson sold a further 1969 Corvette #57 Rebel L88 Convertible for $2,860,000 – the 8th highest price at Scottsdale this year. Mercedes was also well represented in the top results with 9 Mercedes Benz models including 9 300 SL models – five gullwings and four roadsters. 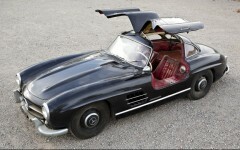 The sensation was a 1956 Mercedes Benz 300 SL Gullwing sold by Gooding for $1.9 million. 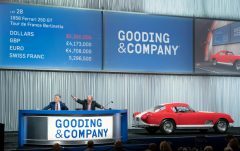 This car was a true barn find and in original but somewhat tatty condition – by contrast, Gooding sold a 1956 Mercedes Benz 300 SL Gullwing in concourse condition for nearly half million less. 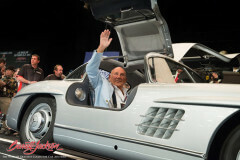 Barrett Jackson achieved over $2 million for a 1955 Mercedes Benz 300 SL Gullwing in pristine concourse condition. The three oldest cars at the auctions achieving more than a million dollars were Duesenbergs from 1929 and 1930. The next major classic car auctions will be in early February in Paris (Bonhams and RM Auctions) and then early March at Amelia Island (Gooding & RM).